One side of the coin features Luang Por Tuad of Wat Chang Hai, 'Dtem Onkg' (full torso) with the other side featuring a Cameo Image (Kreung Ongk) of Pra Ajarn Nong. This exhibit is made from 'Nuea Tong Daeng' Sacred Copper Alloy. The coin has a Code stamp with the Khom Sanskrit Agkhara letter 'Na', which was one of the codes made on all coins of this series, to prevent forgeries, of which there have been a great many attempts. However, as far as those of us in the know are concerned, till now, forgeries have been unable to reproduce some of the finer details of the amulet, such as the 'Ta Sorng Chan' double rides on the eyelids of Luang Por Tuad. The coins were made in various materials including Tong Daeng, Albaca, and Galai Tong. It is one of the highly favoured and also obviously rare coins of the pantheon of amulets of Ajarn Nong. The details of the coin, and the surface sheen of the Chanuan Muan Sarn of Sacred Metals reveleals great beauty to the eyes of the aficionado who seeks the true features of appreciation found in all Rian Kanajarn Pra Niyom. The face with Luang Por Tuad (Wat Chang Hai),has very clearly defined features. The hands of Luang Por Tuad are placed together palms upward, with the thumbs touching each other. The thumbnails are visibly defined. Luang Por Tuad's forehead has five ridges. On the face with Pra Ajarn Nong, the border of the authentic coin can be seen to have a very faint traced line within the two borders. The 'Hoo' (pendant hoop ear) has 'Nuea Gern' (overflow of metal) protruding. The Khom and Thai Agkhara lettering are highly defined, and their ridges stand up vertically. This is not so in the case of forgeries, where the letters have more rounded sides (this is always investigated by holding the coin on its edge horizontally, and viewing the 'walls' of the raised lettering, to see if they have a 'flat roof', or a 'rounded hill'). The edge of the coin reveals its authenticity through the clarity of detail, which is only evident in truly authentic Rian Kanajarn. During his 60 years as a Bhikkhu, he made well over 40 editions of Masterpiece amulets. After Ajarn Nong, ex Abbot of Wat Sai Khaw, in Ampher Koke Po (Pattani) passed away on the 11th September 2542 BE, the ‘Wongarn Pra Krueang’ (Amulet Collector Society), began to gather and keep the amulets of LP Nong even more than before, for they knew that the amulets of Ajarn Nong were already incredibly famous as he was still living, and that these amulets were destined to become extremely rare in the future and jealously guarded by their owners. Ajarn Nong passed away in 2542 at the age of 80, after 60 years as a Bhikkhu. His legend now continues with the Amulets of Ajarn Peng (Subsequent Abbot of Wat Sai Khaw), to Whom he taught, and passed on the Wicha of Takrut Narai Plaeng Roop, and the method for the creation and empowerment of Pra Luang Por Tuad Amulets. This is already now since well over a decade the case, and his amulets are ever rarer to find anywhere. Ajarn Nong is most Famous for making Pra Luang Por Thuat amulets, of which he has Created over 40 different Editions of amulet in the image of LP Thuat. LP Nong made so many different types of amulet, ranging from Takrut, Metta charms, up to Pra Kring, Powder amulets and Yantra Cloths. One of his most famous creations is of course the Takrut Narai Plaeng Roop, which was so famous for its Miraculous Events Experienced with Devotees. He is a Master Gaeji Ajarn of the Southern Khao or magical Lineage. Most of his amulets were empowered with the Lineage Masters of the Khao Or Cave. He is entering History along with the Great Luang Por Tim (Wat Chang Hai) for his contribution to continuing the Dtamra of making Pra Luang Por Thuad amulets. 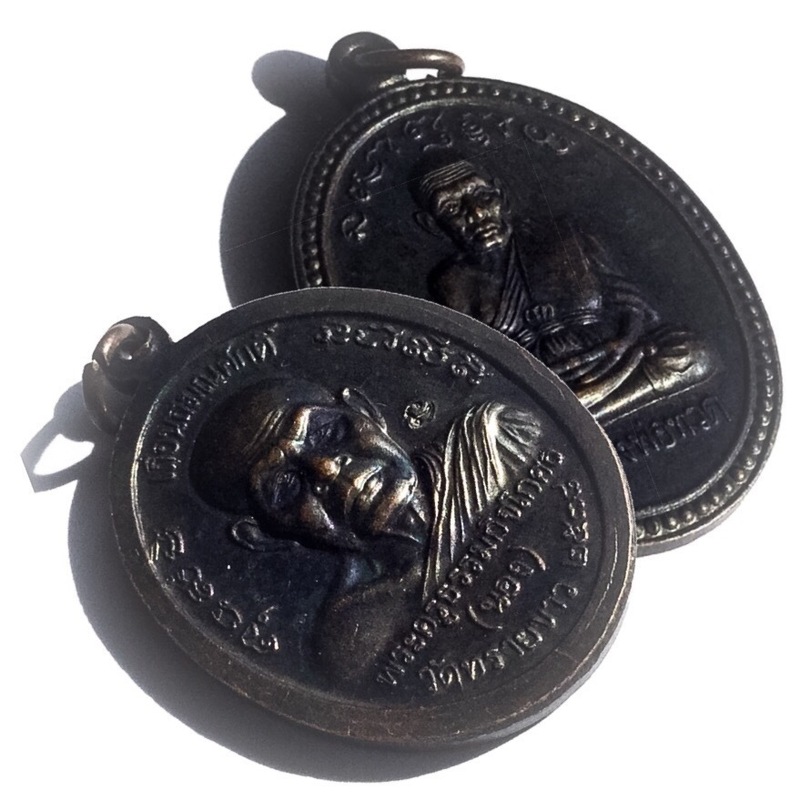 For Luang Por Thuad amulets, his metal amulets in Loi Ongk and coin form are very worth collecting and revering. Ajarn Nong passed away in 2542 at the age of 80, after 60 years as a Bhikkhu. His legend now continues with the Amulets of Ajarn Peng current Abbot of Wat Sai Khaw (written in 2016), to Whom he taught, and passed on the Wicha of Takrut Narai Plaeng Roop.